2003 --These pages are part of the Schuyler co., NY Genweb page. Not for commercial use. Photos cannot be used without the permission of the owner. Elizabeth (mother), Donald (on lap). Back Row, from left: Ruth, David, Dorothy. "Over 120 Smith relatives from as far away as Seattle, Washington and Los Angeles, Calif, came to Lake Seneca to celebrate their heritage along the shores of Lake Seneca. On Aug. 3 the clan gathered at the Hector Fire House for an evening of memories, music and dinner. Many of the guests were from the area, including three of the original family members who were born and raised in Valois: Carl Smith of Valois, Donald Keith Smith of Valois and Virginia Smith Knapp of Horseheads. The oldest living Smith, David Lamoreaux, 97, came from Baltimore. Md. with his granddaughter, Shannon Reilly, nine weeks old, the youngest Smith. Nine generations of Smiths have lived in the area. The family, headed by Steven and Nellie, first settled near Lodi in 1804. Sally Jo and Keith Smith still live in the 200-year-old family farm house in Valois on Route 414. Over the years the farm house served many purposes including a vineyard, a fruit farm, a dairy, a tavern, and an inn. 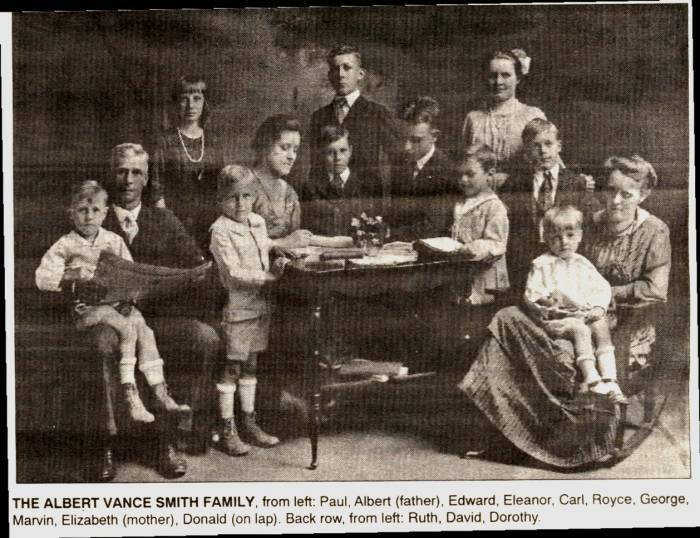 The Albert Vance Smith family shown in the picture lived at the farmhouse with their 12 children. Marvin Smith, also in the picture, continued to run his vineyard from the farmhouse until his death in 1991. The Valois farm house stands next to the cemetery where six generations of Smiths are buried. Smith men served in the Civil War, World War I, World War II and Korea. The Ladies Auxiliary of the Hector Fire Department catered the Smith Reunion. The family dined on an array of fine food and wine from nearby wineries. On Sunday 65 family members gathered at the Hector Presbyterian Church to remember Smiths who had passed away."